Batala May 4:- Gems Cambridge International School Batala has won 6 Gold and 14 Silver Medals of excellence in the International Mathematics and English Olympiad. Besides 61 medals at different level in the Olympiad. 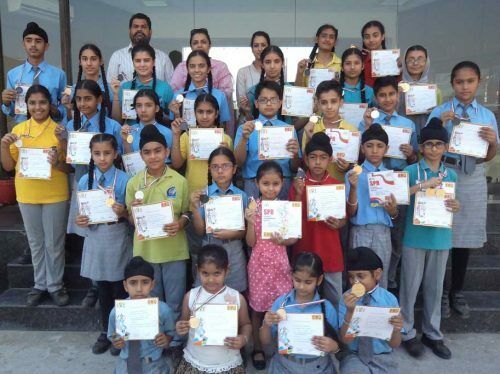 Mrs Manjit Sangha, Director told that 5 Gold and 14 Silver medals of excellence have been bagged in 9th Mathematics Olympiad and one Gold medal of excellence , organized by the Science Olympiad Foundation New Delhi. She said that 33 medals including 13 Gold, 9 silver and 11 Bronze medals were won school students in 6th International English Olympiad and 28 medals including 11 Gold, 9 silver and 8 bronze in 9th International Mathematics Olympiad .